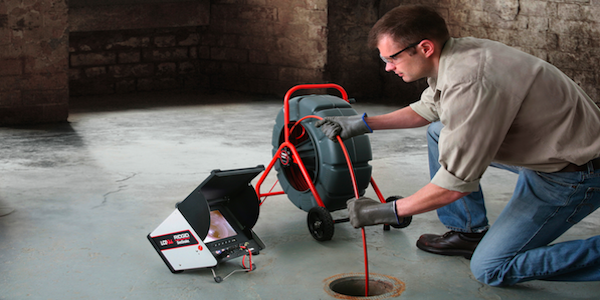 DrainMaster’s revolutionary sewer video inspection system provides real-time information to ensure efficient sewer repairs and enable you to take control of your sewer maintenance. Our technology has a wide variety of uses, including repairs and renewal planning, sewer mapping, and pre-inspection. We reveal all your sewer system’s secrets, so we can restore it to optimum function. Sewer video inspection is performed with a carefully-designed, waterproof camera that can withstand the dirty, crowded conditions deep inside a sewer pipe while still collecting high definition video that’s clear enough to expose subtle signs of deterioration. The footage is fed instantly through a fiber optic cable to a screen where the DrainMaster technician can review it immediately. You can also see the video if you would like to see the condition of your pipe for yourself. Our technician will carefully work through the pipe and note areas that require attention so that a plan of resolution can be developed. Our sewer video technology is an important part of our trenchless repair techniques. The camera serves as the technicians’ eyes, helping to guide tools and repair materials through buried or inaccessible pipes so they can be repaired without the need to expose them. Video footage is also collected at the end of the repair process to ensure that the problem has been fully resolved and the solution is working effectively. If you would like to take a proactive approach to sewer repair so you can save money, you can also take advantage of DrainMaster’s annual sewer video inspection service. Our experienced technician will survey the interior of your pipe and make note of areas that are beginning to show signs of weakness or with deterioration that has progressed. With this information, we can help you develop a restoration program to clear away corrosive and damaging buildup and strengthen weakening pipe walls with liners. You can save thousands of dollars in repair costs and take control of your sewer system condition simply by scheduling a low-cost annual inspection. DrainMaster Ohio also offers sewer mapping service with our video system. We can trace the paths of buried sewer lines through your property and provide a detailed diagram to aid in the planning of new construction or landscaping projects. With this information, you can confidently dig for new foundation walls, post holes or utility lines without concerns of accidentally striking a sewer line in the process. Our sewer video inspection is also available to assist with new home or facility construction inspections. We can perform a rough-in or final pre-inspection to verify that your sewer or plumbing system will meet current building codes. Our technicians are fully versed in local, state, and national building requirements, so we can readily identify any installations that may not meet code so that you can correct them before calling the building inspector. A failed inspection can significantly delay a construction process, but you can easily avoid it with a quick, inexpensive inspection. Call DrainMaster To Schedule A Camera Inspection In Your Ohio Home Today! DrainMaster is ready with advanced sewer video inspection service to make installation, maintenance, and repair of plumbing fixtures an easy, painless process. We give you the knowledge you need to take control of your plumbing maintenance. Call us today to schedule your affordable inspection!